I totally blame my recent research for tomorrow's issue of The Scrap Basket. 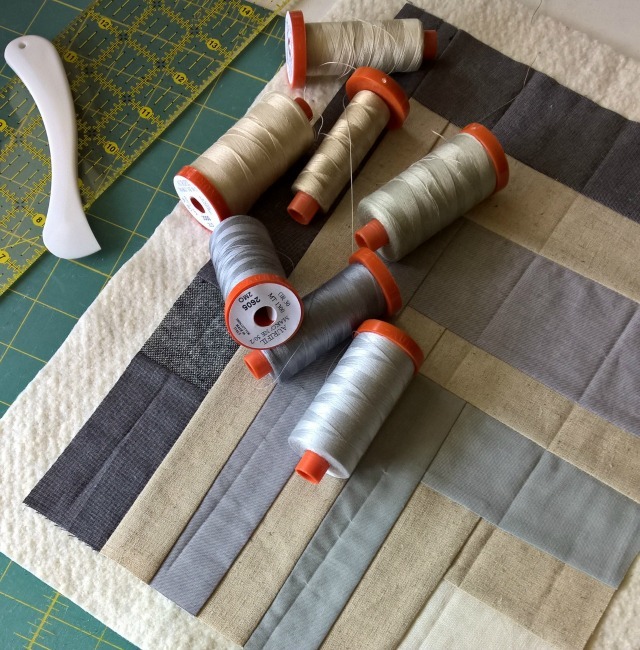 Yesterday when I had a couple of hours to sew, I glanced at the scraps covering my design wall, at the stack of modern-minded hexies piled on my ironing board, and even at 2 wips in the closet, you know, the kind with deadlines. But what I was really itching to make was a quarter log cabin block. A quilt full of them would have been better, but that wasn't going to happen in the time allowed, so I settled for 1 block. Working from Heather Jones' Half Way Home tutorial just up on the Robert Kaufman website, I literally pulled from the scrap basket as I began to sew, seeking a very neutral palette and as many linen-cotton blends as I could dig up. When the block was done, it measured only 9"x12", yet I had the urge to just quilt it up and make it into a mini quilt. Why not? So I gathered a handful of Aurifil 50wt threads - a variety to make things interesting - and got started. When a project is this small, even matchstick quilting takes almost no time at all. I bound this little one while watching TV last night, reflecting on how satisfying a sew it was. Not preplanned in the least, but out of an impulse to make grew an inkling of a project, which soon materialized into something small yet fulfilling. How good can it get? it's fantastic. Now I want to drop everything and make one myself :). I so love the fabrics you chose, and that quilting of course is simply wonderful. That triangle binding is PERFECT!! 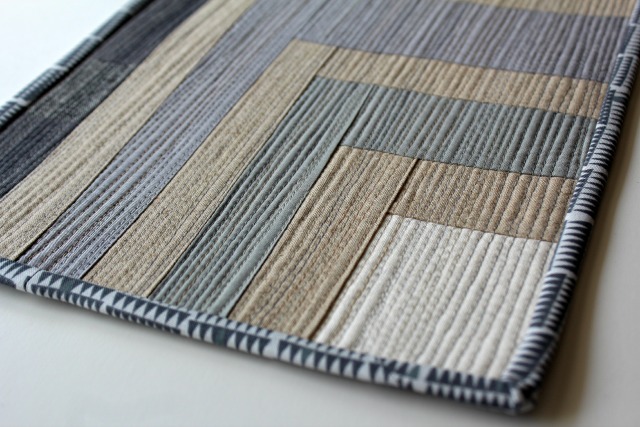 Great colours and texture ~ love the size! I love it, and what a wonderful way to spend your time. Lovely! What a relaxing time and a successful result. I often tell myself I must make the real deal--a huge honkin' quilt... and lately I have several more on the go than I am comfortable with because I lose steam... sometimes you just want to finish something! I will try this week to talk myself into making something small... it will be good for my soul! 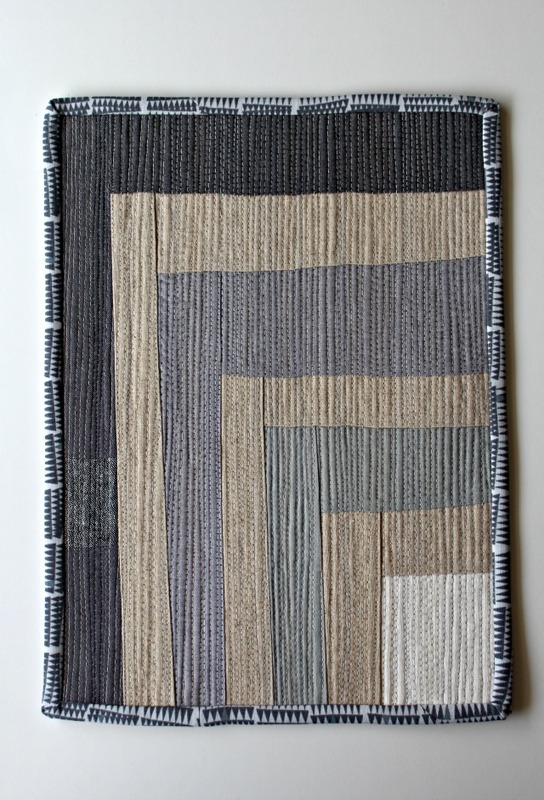 I really want to make this quilt too. A big one. Great idea! 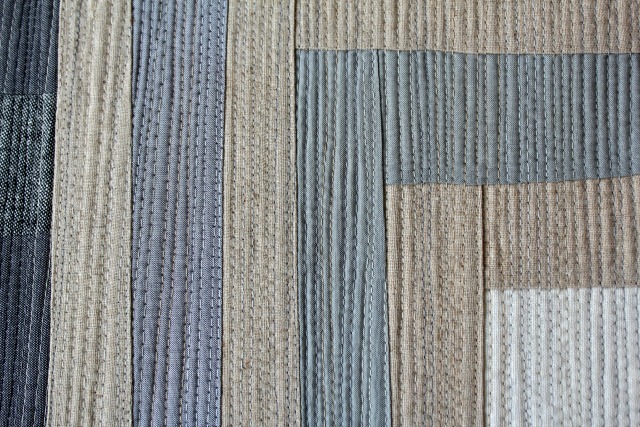 I really want to try matchstick quilting. A mini quilt is the way to go! How fun. I should give this a try. Making something small that might actually get done and then having the satisfaction of completion. I have too too many unfinished projects.